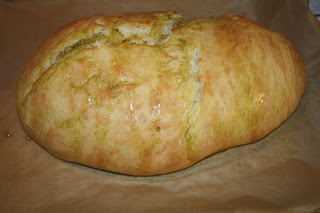 Preheat the oven to 350 degrees F. Grease a 9 by 9"inch baking pan with the Baklouti olive oil. Combine the flour, cornmeal, honey, baking powder, and salt in a large bowl. In a separate bowl, combine the milk, eggs, and olive oil. With a wooden spoon, stir the wet ingredients into the dry. Mix in the grated cheese, scallions and Anaheim peppers. Pour the batter into the prepared pan, smooth the top, and sprinkle with the reserved grated cheese and scallions. Bake for 30 to 35 minutes, or until a toothpick comes out clean. Cool and cut into large squares. Serve warm or at room temperature. Preheat oven to 425. Grease a 9” rectangular pan. Combine corn meal, salt, flour and baking powder in a bowl. In a separate bowl, whisk the olive oil, egg and milk together. Add to the dry ingredients and mix until just moistened. Bake for 20 - 30 minutes until the tops are golden brown.